From bonnie of bismarck, North Dakota on 2/6/2019 . this brand of cheese is the BEST tasting cheese and I have tried a lot of them. you can make chips and cheese and it melts nicely on the chip. I can't wait to use the mozzarella when in stock. the cream cheese is also awesome! From Cassidy of Salisbury, Maryland on 12/27/2018 . 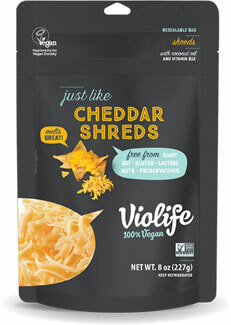 These are BY FAR the best shredded cheese option on the market right now. I used this over the holidays to make "cheese" balls, taco dip, and tons of other recipes and no one suspected it was vegan. So happy this is on the market!